It's tough to keep a job you like. I've managed to do it for almost three decades, but my daughter has not been so lucky. A few months ago, she went with my wife to try to join a new gym in our town, helped the staff translate for some Spanish-speaking customers, and then ended up with her very first job. She loved it, and was fairly gung-ho on it until quite recently. The manager who hired her got fired, as did a much-loved and hard-working cleaning person, and my daughter and a whole bunch of her co-workers were no longer happy. So they organized, made a list of demands, and quit en masse. I don't suppose they will see their demands realized. This is a disadvantage of 8-dollar-an-hour, zero benefits non-unionized jobs. She's fortunate in that she doesn't actually need this job. If she did, it would be a lot harder to take a stand. Around the country, minimum-wage workers have taken stabs at organized protest. But it's a lot tougher if you work several of these jobs just to make ends meet. Should we really be placing working Americans in that position? I don't see how it helps anyone, even if Gates, Broad, Waltons, and the Koch Brothers are OK with it. But the solution is simple. I've long felt, for example, that if we made those who administer schools systems patronize them you wouldn't have school trailers. Bloomberg wouldn't want that for his kids. Nor would John King or Barack Obama. And clearly, though they publicly praise charters, they don't place their kids in them. Actually I don't mind that my kid takes a job where she doesn't make a whole lot of money. She's learning on the job, and she's OK with it. But we need to do better for people who haven't been teenagers in a long time. They haven't really got time for the luxury of practice. So why don't we have Congress put their money where their mouths are? If they think 8 bucks an hour is a fair wage, why not have them live on it? In fairness, maybe those who chair committees could earn an extra buck an hour. If they pass bills that actually help people, maybe that could increase their hourly wage too. While it's true merit pay hasn't worked in the hundred years it's been around, Congress seems to be OK with methods that don't work, like VAM and Common Core. Let them live with it. Of course we'll give them every advantage of Obamacare, including allowances for income when we yank their health insurance. That's only fair. After all, Congress doesn't think single payer is a good idea, and doesn't want to grant Americans the sort of health insurance they have, but as soon as the signup period opens up they can apply like everyone else. Naturally I hope they don't get sick in the meantime. 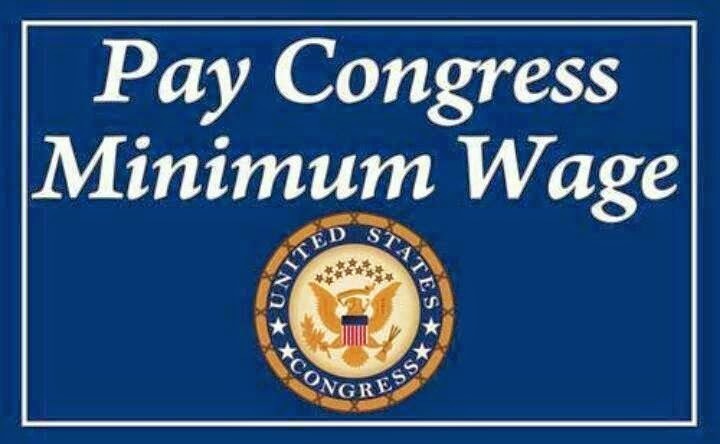 And of course if they decided to raise the minimum wage for all Americans, they would benefit too. Maybe if the laws they passed actually affected them personally, they'd think more carefully about what does and does not merit their attention.